Spaghetti Sunday: La Strada per Ventiquattro Ore! I’ll continue what TFritch started last Friday: the road to Le mans! And as it is Sunday I’ll start with an Italian car, a car that changed a lot for it’s manufacturer: Ferrari. Why? Because Enzo Ferrari had always claimed it was wrong “to put a cart before the horse”. And that’s why Ferrari came relatively late with the MR-layout. This Ferrari 250P wasn’t the first Ferrari with a MR-layout (that would have been the monoposto 156 in F1 and the Ferrari Dino 246SP in Sportscars) but it was the first having a V12. And an instant winner for the Maranello team. With the Dinos Ferrari had switched to numbers based on displacement and cylinders so the 246SP had a 2.4 liter V6. The 250P (Prototipo) had the old numbering: 250cc in each cylinder. That meant a 3 liter engine as it was, as said, a V12. And that engine was well-known as it basically was the same engine Ferrari had used for years. The 250 Testa Rossa. With it’s 6 Weber 38 DCN carburatore it put out just over 100hp per liter: 310hp @ 7.5K RPM. The Testa Rossa still had a 4-speed but the 250P was equiped with a 5-speed Manuèl. Four disc brakes wasn’t that unusual in racing back then, the rear ones though were mounted close to the differential to keep the unsprung weight low. With it’s 760kgs weight (each kilogram was gifted with 0.41 hp!) it could reach 290 km/h. Not bad if you know we’re still in 1963. And in that year it won a lot. The opening race of the season, the Sebring 12 hours, Ferrari took position 1 to 6, with the top two taken by 250Ps (the others being GTOs and a TR). The second big event that year was the ADAC 1000 km Rennen at the Nürburgring. Die Grüne Hölle. Ferrari was quite successful there as well as the top-3 were Ferraris. Two privateer teams just missed the wins with their GTO and TR: the Ferrari factory team won it with another 250P. And then the biggest even would follow. Le Mans. The 1963 edition would prove to be a lethal one. Brazilian driver Christian “Bino” Heins would crash one of my favorite Le Mans cars of all time, the Alpine M63, in a pile of cars that blocked the track after Bruce the McLaren/Innes Ireland Aston Martin DP214 blew up, causing 20 liters of oil to be spilled on the track. For Ferrari however, it proved to be another huge success. Another top-6. The two factory 250Ps were resulted in a first and third place. The others again all kind of privateers with their GTOs. And one 330 Le Mans Berlinetta, which in fact was a redeveloped GTO. But as that one finished over 25 laps behind the number one 250P the path was cleared for the MR layout at Ferrari’s. The winning 250P was the #21 you see here. A completely Italian car as both the drivers, Lorenzo Bandini and Ludovico Scarfiotti, came from Italy as well. Both would end up driving Formula 1 for Ferrari. And both wouldn’t reach 35 as they both died while competing in racing events: Bandini in the 1967 Monaco Grand Prix and Scarfiotti in a local 1968 Hillclimb in Berchtesgaden. Hey, why ain’t that driver behind the steering wheel? The model itself is a 1/43 by ArtModel. I don’t have many of those but when I ran into this one it was a no-brainer: no one in their right mind should leave this one if it’s offered for barely over 10 euros. 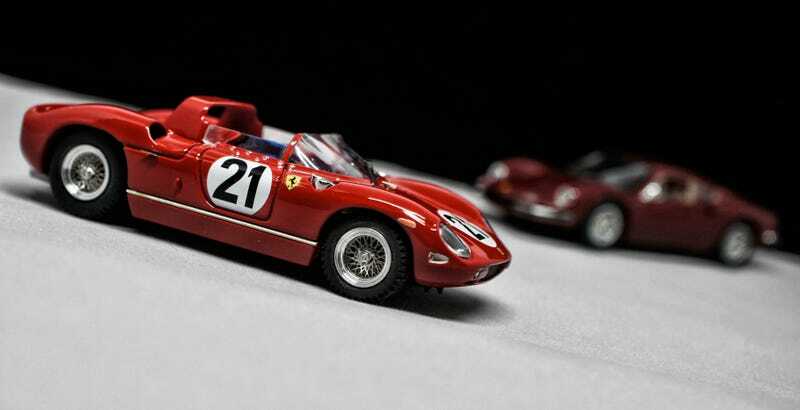 I’ve shown another ArtModel before and I really adore their classic line of Ferraris. It came from the same haul I got the Bang Dino 246 GT in I showed last week. The details are amazing on this one, I’m so glad I had to look out for 308s for TFritch as that was the reason I ran into it in the first place IIRC. So that’s it for this week’s Spaghetti Sunday. I hope you all will get out some Le Mans cars next week to celebrate the best event of the year. I saw Herr Quattro digging out a 250LM already today, this is gonna be great. Ciao Tutti!